The historic fort is looking for help to restore the fort to re-open to the public with the help of volunteers on October 27. The fort has remained intact for over 30 years but original construction has now begun to show flaws and currently all four of the bastions are in unstable conditions and is unusable for public visitation due to numerous safety hazards. Franklin County Visitors Bureau recommends all to join in keeping local history alive by joining the effort by the Fort Loudoun Historical Society to restore the historic Fort Loudoun on October 27. The fort has remained intact for over 30 years but original construction has now begun to show flaws and currently all four of the bastions are in unstable conditions and is unusable for public visitation due to numerous safety hazards. The day has been set aside to ask volunteers of all skills to begin work in restoring the walls, among other things needed to get the fort useable again. Among the requested volunteers, the Fort Loudoun Historical Society has said the day and help is open to roofers, carpenters, heavy equipment operators, painters, HVAC mechanics, electricians, plumbers, floor installers, gardeners, landscapers, welders and more. Donations will also be accepted to help toward several repair projects that need to be done. 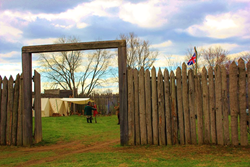 Fort Loudoun was reconstructed in the late 1980’s from archaeological research and written history. Originally, it was built in 1756 by the Pennsylvania Provincial Regiment to provide defense for frontier settlers and also served as a post for Henry Bouquet during the Forbes Road Expedition in 1758. Though built to protect the people of the frontier, Fort Loudoun, under the control of the British military, ended up being a source of harm to the settlers. The British military turned a blind eye to traders, supplying the Iroquois with weapons and ammunition, which were used to attack settlers. Allegheny Uprising, a 1939 film starring John Wayne as James Smith, uses the rebellion at Fort Loudoun as its historic basis. Any interested individuals looking to learn more about where the donated funds will go can schedule a tour to view the site at 1720 Brooklyn Road in Fort Loudoun by emailing projectmanager@fortloudounpa.com. The Franklin County Visitors Bureau invites all to explore Franklin County PA and enjoy the history, arts, recreation, natural beauty, fresh foods and warm hospitality of communities like Chambersburg, Greencastle, Mercersburg, Shippensburg, and Waynesboro. Franklin County PA is located just north of the Mason Dixon Line and an easy drive to Washington DC, Philadelphia, and Pittsburgh. Discover more….plan your visit at ExploreFranklinCountyPA.com , by contacting 866.646.8060 or 717.552.2977.